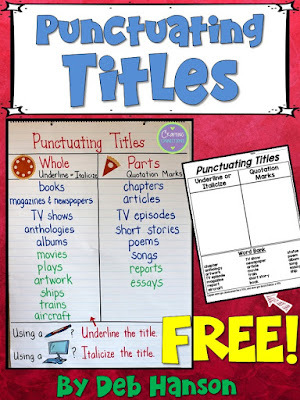 Do you teach students how to punctuate titles? 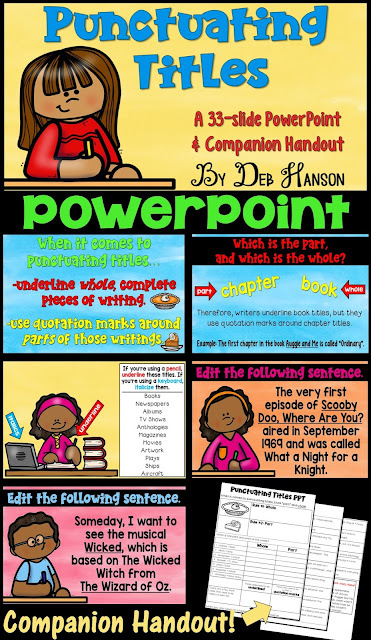 It's a 5th grade standard (L.5.2.d), but in the past, I definitely touched on the more common rules (books, chapters, poems, songs, magazines, & articles) when I taught fourth grade, as well. 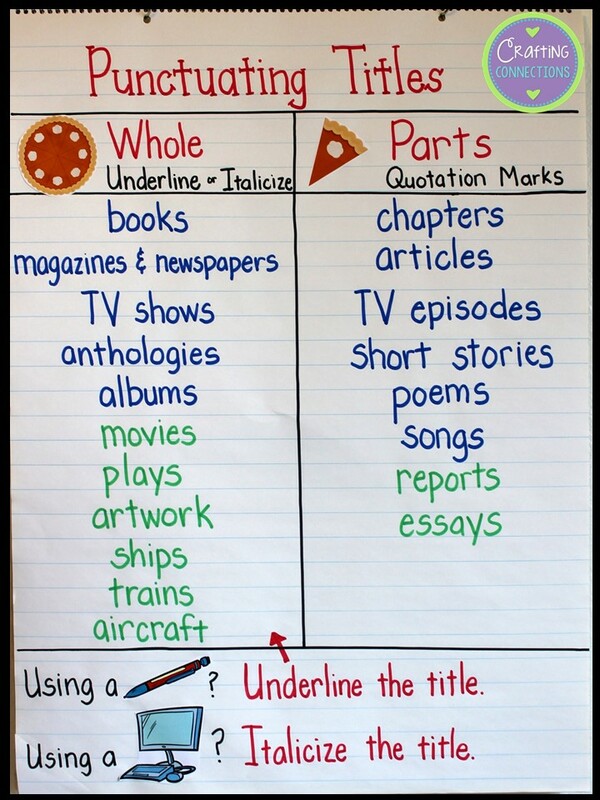 Once class begins, I will ask my students to help me fill in the anchor chart. 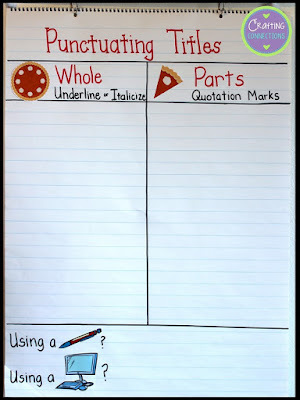 First, I will tell my students that when it comes to punctuating titles, there is a guiding question they can ask themselves that will help them punctuate the majority of titles: Is this a WHOLE literary work, or is this a PART of a literary work? 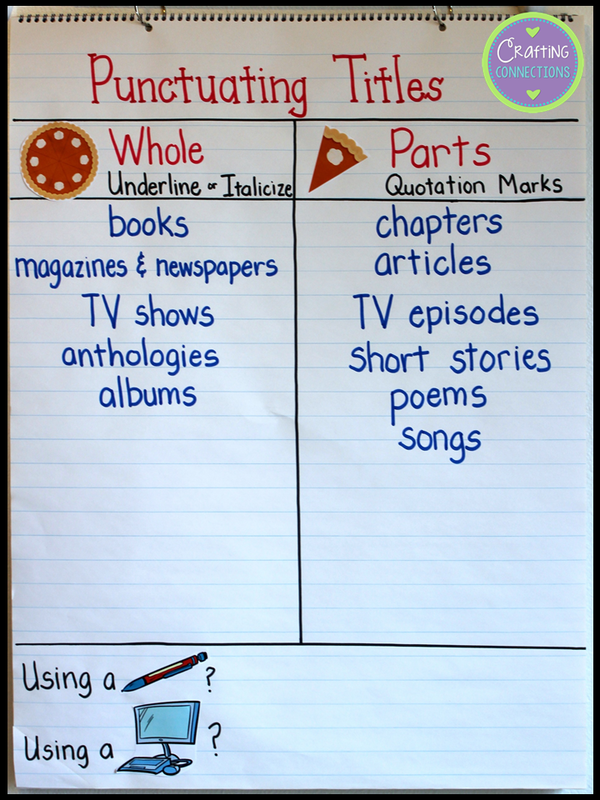 I'll explain that whole, complete literary works are underlined, while partial literary works are placed inside quotation marks. 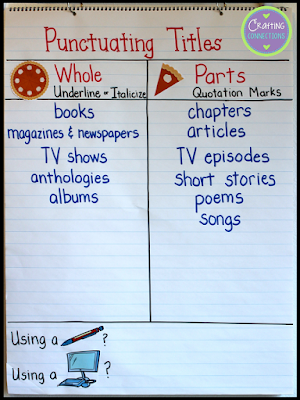 Next, I'll list associated pairs (book and chapter, for example), and I'll have students tell me in which column each literary piece should be written. After we've listed all of the titles that follow the whole vs. parts guideline, I will tell my students that there are a few items that need to be added to the column of titles that need to be underlined. After switching to a green marker, I will add the additional four items to the bottom of that column. 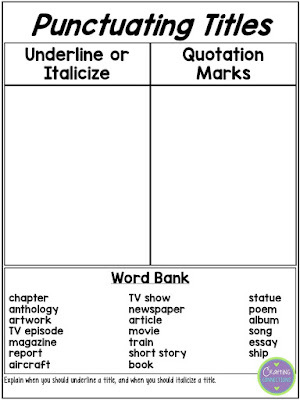 Likewise, I will add a couple items to the bottom of the quotation mark list. These items written in green don't really follow the whole vs. parts rule, and simply need to be memorized. 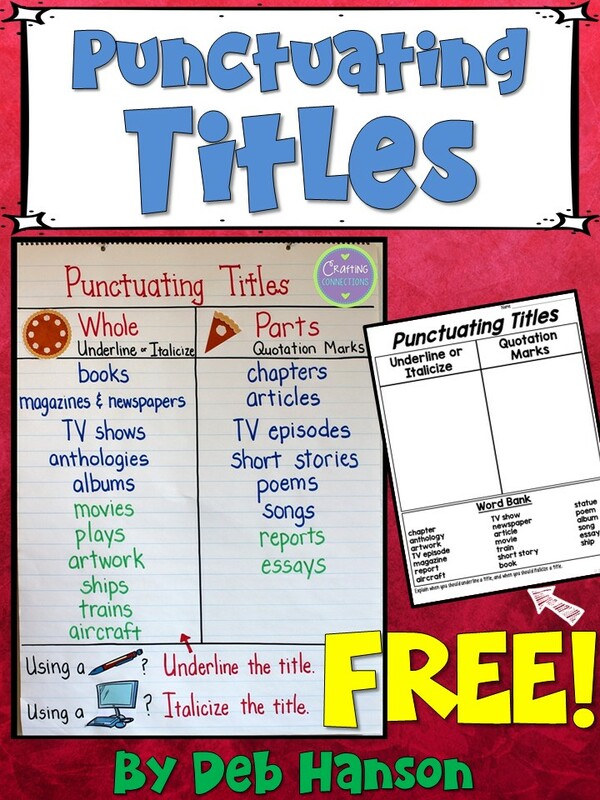 If you don't have time to make the anchor chart, you might want to consider purchasing my Punctuating Titles PowerPoint. Slides 4 through 16 take the students through a similar part vs. whole exercise. It also makes the same point about italicizing instead of underlining when you are using a keyboard. Furthermore, it concludes with 17 practice sentences. 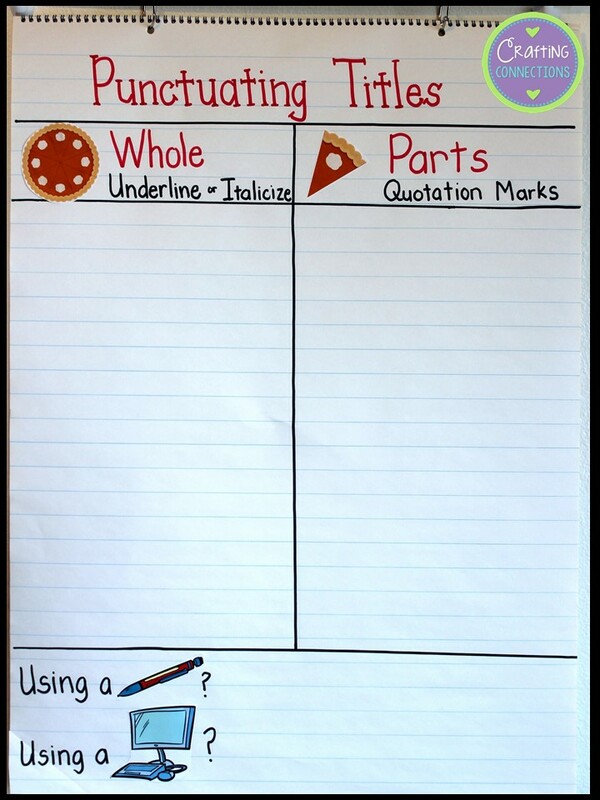 Whether you choose to use the anchor chart or the PowerPoint, be sure to download this FREE PRINTABLE by clicking on the image below! I plan to use it as a quick exit ticket. This sorting activity will allow you to check for understanding.